January/February 2018. 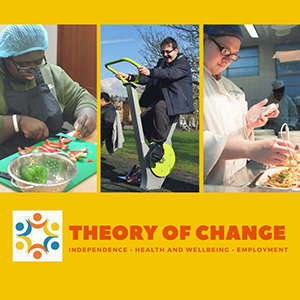 Theory of Change. FREE impact report and recipe calendar. Investors in People. Share staff team. Plant Sale and Healthy Living Community Day. At Share, we don't rest on our laurels! 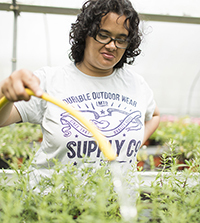 2017 was an amazing year for us, but we know there is always much to do if we are to make a continuing and lasting difference for the people we support. So towards the end of last year we set aside some time to think long and hard about what Share's priorities would be in the next few years. This so-called 'Theory of Change' aims to identify our strategic goals and sets out how we go about achieving those goals, which, in turn, helps us to develop our plans, activities and priorities for the coming years. So what conclusions did we come to? Visit our website to find out more. Share's Impact Report for 2016/17 is a recipe calendar! 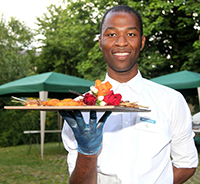 All of the recipes were developed as part of Share's independent living skills programme in association with our healthy living project, Live Well, Feel Great!, to help our students to learn everyday skills such as cooking a simple, nutritious meal for themselves. 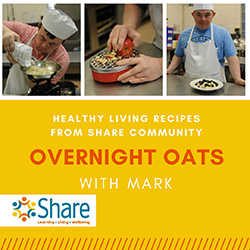 Check out our recipe of the month for January – Overnight Oats with Mark! In February, Chris will show you how to make Eggs en Croute so look out for that on Share's YouTube channel. Share's accreditation as an Investor in People (IIP) has been renewed for another three years. Share was first accredited under the IIP standard in 2011. This signifies Share's continuing commitment to putting people – whether it be students, staff or volunteers – at the heart of the organisation and the work we do. A warm welcome to Gina Morten (far left), our new digital inclusion manager, and Joanne Smith, who joins us as an additional lunchtime activities leader. 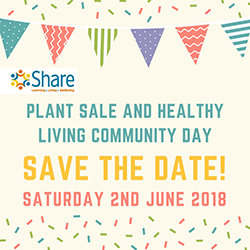 The date is set, the seeds are sown and the planning has begun for Share's grand Plant Sale and Healthy Living Community Day! Join us on Saturday 2nd June 2018 for a fun day of healthy activities and foodie treats for all the family, and plants galore for sale. To find out more or get involved, contact Jenny Bourlet via email jennyb@sharecommunity.org.uk or telephone 020 7801 9813. Saturday 2 June 2018. Plant Sale and Healthy Living Community Day. Save the date...more information coming soon!